The STRYKER 3407 AND 4407 skid steer wood splitter attachments are great choices for operating with auxiliary hydraulics. There is no need to have a second operator in the cab as it can be operated independently, with the controls mounted on the log splitter. Both models come standard with the double-sided 2-way knife and the 4-way knife. The 4-way knife works great for wood up to a diameter of 10”-12” and can be interchanged in less than 15 seconds with the double sided 2-way knife, giving you complete control over your wood splitting needs. 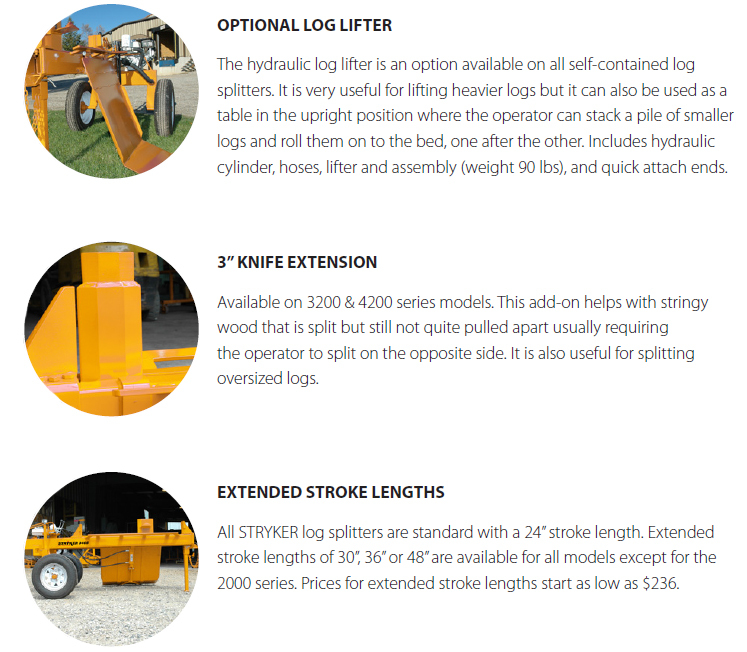 The STRYKER 4407 model is manufactured with a 7” by 7” reinforced solid steel tube frame, reinforced stops and frictionless Ultra-High-Molecular-Weight polyethylene sliders, making it among the most rugged, longest lasting log splitters available on the market today.